In the summer of 2005, a Marine Corp unit just back from Fallujah and the Iraq War was charged with completing the demolition of the original 14 miles of primary fencing that was constructed between 1990 and 1993 from the Pacific Ocean inland to divide the two countries. The fence was constructed of 10 foot-high steel army surplus landing mats (M8A1) with the assistance of the Corps of Engineers and the California National Guard. The original landing mats were manufactured by the Syro Steel Company in Girard, Ohio in 1968 and were used during the Vietnam War. Each original steel mat measured 22 inches high x 12 feet long and were pieced and welded together to make the border wall. On the final day of the demolition, nearly 3,000 lbs of this fencing was salvaged, enough to construct a border wall that could measure approximately 10 feet high x 60 feet long. 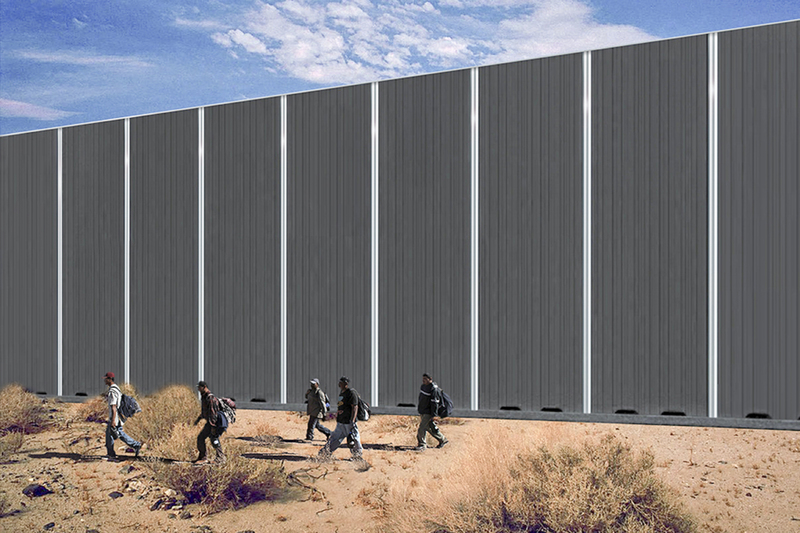 Projects may include, but are not limited to the design and construction of a solid concrete wall prototype and various miles of border wall along the southwest border (i.e. San Diego, CA to Brownsville, TX). Each IDIQ contract will have a maximum contract value not to exceed $300,000,000. The wall design shall be physically imposing in height. 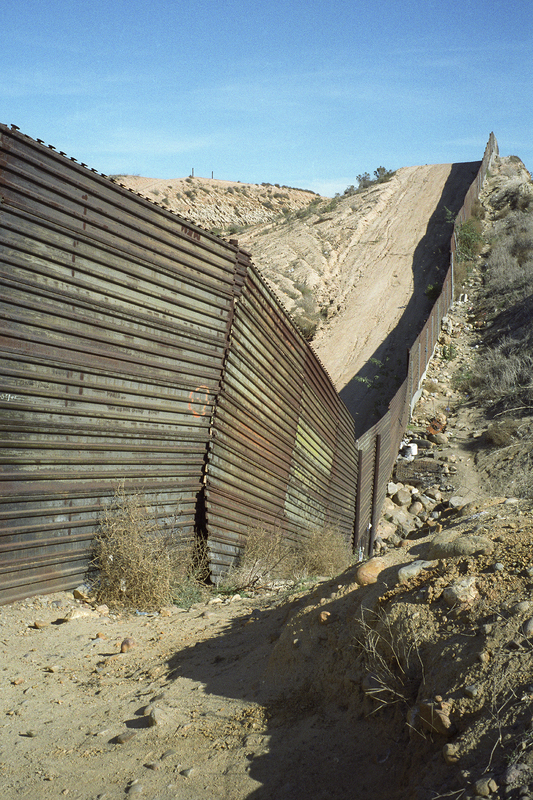 The Government’s nominal concept is for a 30-foot high wall. Offerors should consider this height, but designs with heights of at least 18 feet may be acceptable. Designs with heights of less than 18 feet are not acceptable. It shall not be possible for a human to climb to the top of the wall or access the top of the wall from either side unassisted (e.g. via the use of a ladder, etc.). The wall design shall include anti-climb topping features that prevent scaling using common and more sophisticated climbing aids (e.g. grappling hooks, handholds, etc.). The wall shall prevent digging or tunneling below it for a minimum of 6 feet below the lowest adjacent grade. The north side of wall (i.e. U.S. facing side) shall be aesthetically pleasing in color, anti-climb texture, etc., to be consistent with general surrounding environment. The manufacturing/construction process should facilitate changes in color and texture pursuant to site specific requirements. 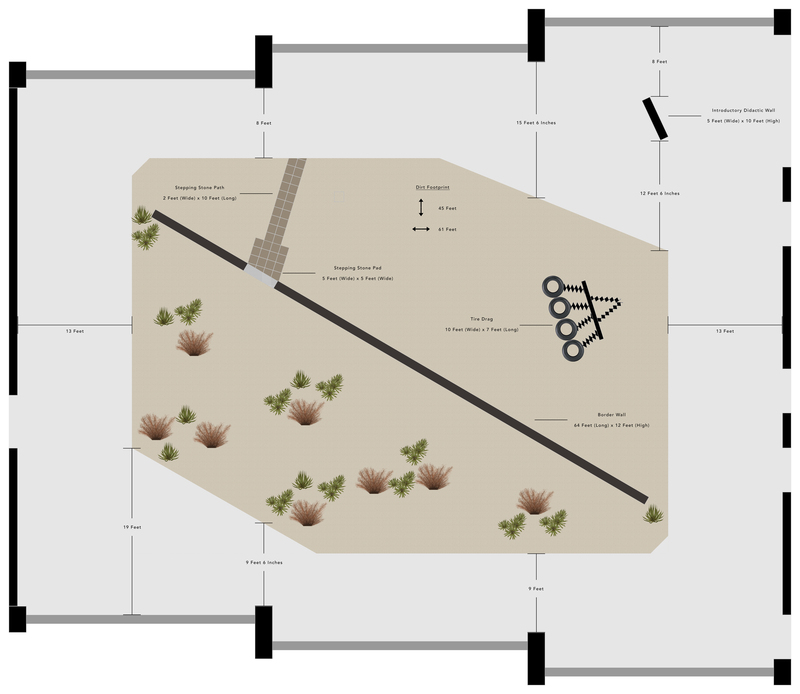 In a time of national polarization and apprehension, Estamos Buscando A – Border Wall Installation is an immersive, large-scale installation that re-materializes the physicality and psychology of the U.S.-Mexico border as a 12 x 64 foot free-standing wall on 60 tons (120,000 lbs.) of dirt on a nearly 3,000 square foot (45 x 61 feet) footprint. Constructed with the salvaged sections of fencing from the original border wall, the Mexico side of the installation serves as an altar to support photographic portraits of migrants printed on aluminum, referencing religious iconography of the retablo and votive paintings found in churches throughout Mexico and quietly speaking to the enduring human spirit of the migrant experience. In contrast, the imposing U.S. side of the installation—based on a 2017 request for proposals from the Department of Homeland Security—foretells a future of isolation and detached nationalism. Various ephemeral materials—including government signage and a tire drag—heighten the presence of national security while the discarded, personal belongings of migrants speak of the border experience as not just a topic of political debate, but rather as a harrowing and longstanding human ordeal.